Heat oven to 350°F. Spray bottom of 13x9-inch (3-quart) baking dish with cooking spray. In large bowl, beat eggs and milk with whisk; stir in garlic, salt, pepper flakes and cheese. 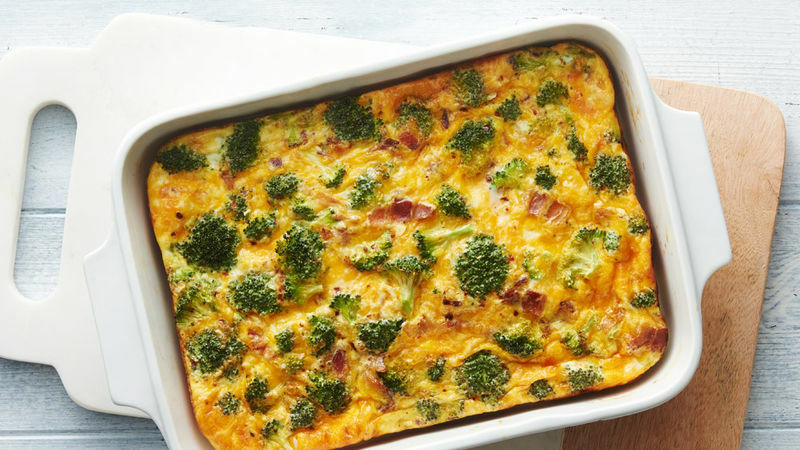 Add broccoli and bacon to baking dish, spreading evenly. Pour egg mixture on top, gently stirring mixture to distribute. Cover and refrigerate about 8 hours (overnight). Uncover; bake 35 to 40 minutes or until just set and knife inserted near center comes out clean. Let stand 10 minutes before serving. Precooked bacon is sold in the refrigerated, packaged meat section, making this recipe easy to throw together in very little time. This dish can also be made and prepared the same day, but adjust the bake time to 30 to 35 minutes and check for doneness.